Food Market Hub is designed specifically for F&B, not just Restaurant. But also for Hotel, Central Kitchen, Cafe, Food Court, Kiosk. Why Restaurant Group like Din Tai Fung, Rhombus Group, Brazzo Group, The Chicken Rice Shop, Myburgerlab, Mohd Chan Group, Syed Group, Paradise Group are using Food Market Hub? We not just help them manage their daily operation to achieve lower cost, higher productivity and higher profit margin, we also help them do sourcing from supplier. 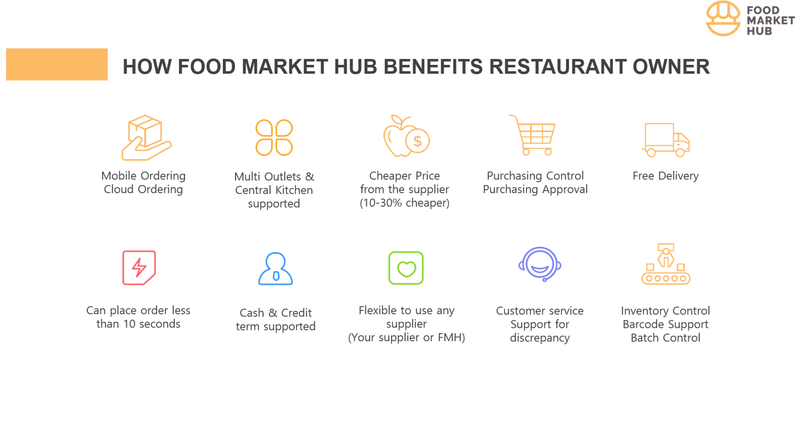 With number of outlets we have, supplier willing to offer better price (up to 10-30% discount than your normal price) to F&B operators that subscribe to Food Market Hub. Talk to us to understand how we can help your F&B business grow!